The first step in developing a maintenance plan is having a thorough maintenance appraisal done to evaluate your building beyond the usual brief inspection of a spot or two that many contractors make. These appraisals provide the information needed to develop a maintenance plan specific to your building's needs. Exterior Woodwork Features Porches, stairs, railings, cornices, brackets, etc. Comprehensive energy audit by Pure Energy Audits Pure Energy Audits is historically sensitive and will provide you with an accurate energy audit. They are not replacement product salespeople tailoring their audit to sell you what they promote. 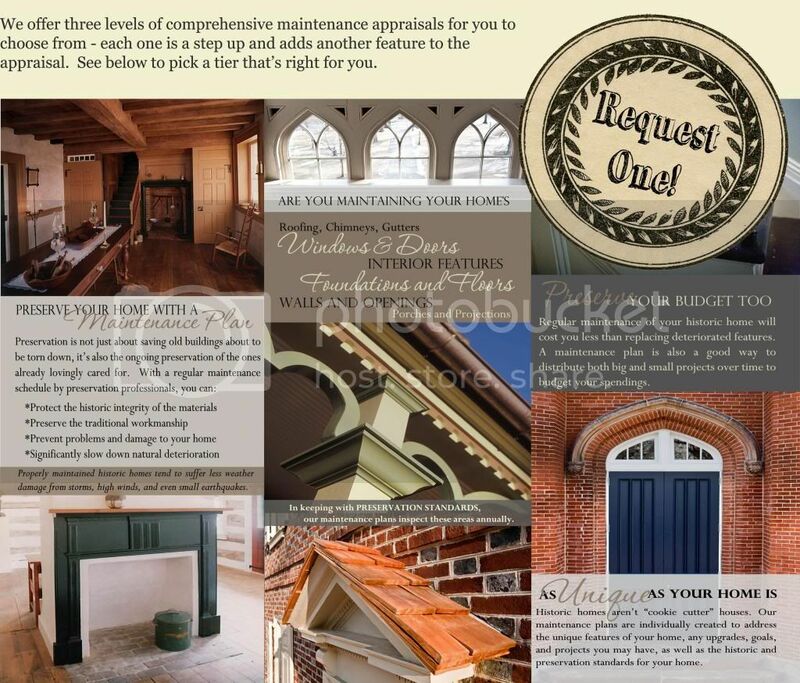 Maintenance plans are not just important to your historical building, they are absolutely essential if you want to preserve its architectural integrity for future generations to experience and appreciate. The first step in developing a maintenance plan is having a thorough maintenance appraisal done to evaluate your building beyond the usual brief inspection of a spot or two that many contractors make. These appraisals provide the information needed to develop a maintenance plan specific to your building’s needs. Porches, stairs, railings, cornices, brackets, etc. (8) Eight hours of labor to correct any immediate maintenance issues. (16) Sixteen hours of labor to correct any immediate maintenance issues. Pure Energy Audits is historically sensitive and will provide you with an accurate energy audit. They are not replacement product salespeople tailoring their audit to sell you what they promote.